Pineapples were valued as a luxurious treat and symbol of prestige and hospitality in colonial America. These days, the fruit is more widely available, and focus on its value is shifting toward its health properties. For example, pineapple is rich in enzymes that reduce inflammation and aid digestion. Pineapples help you digest protein. That’s because they contain bromelain, a group of proteolytic, or protein-digesting, enzymes. The bromelain in pineapple also may help alleviate heartburn and stomach upset, and this fruit has been used in South and Central America for these purposes. Pineapple may be a more effective heartburn remedy when you use it in conjunction with the enzymes lipase, which digests fat, and amylase, which digests starch, according to University of Maryland Medical Center. Pineapple is commonly used in folk medicine to treat constipation and digestive problems. 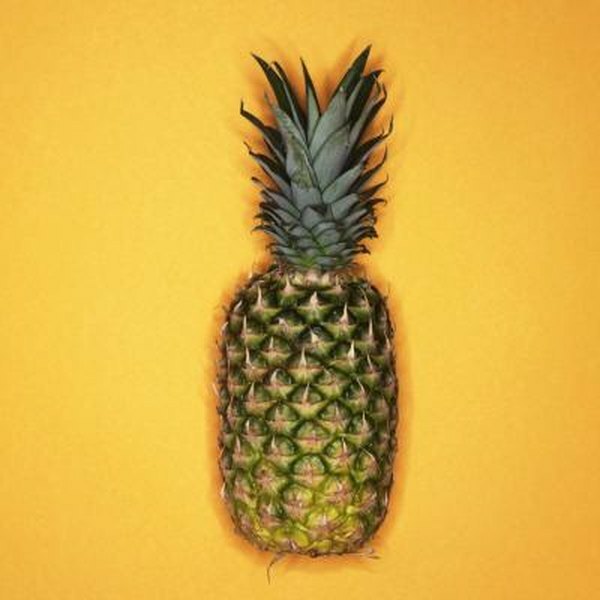 The bromelain in pineapple also may be valuable for reducing inflammation associated with injury and infection, according to the University of Maryland Medical Center. Germany’s Commission E, that country’s regulatory body for herbs, approves bromelain for treating post-surgery inflammation and swelling. Eat pineapple with your meals to promote digestion. Eat it between meals to help reduce inflammation, recommends “Raw Food for Everyone,” by Alissa Cohen and Leah J. Dubois. No standard dose of pineapple has been established as of 2011. Pineapple also provides a variety of other substances and nutrients that are beneficial for your health. For example, pineapple is a rich source of dietary fiber, manganese, calcium and potassium. You may experience side effects when consuming pineapple, especially if you consume large amounts. The most common is diarrhea. An allergic reaction also is possible. Pineapple may raise your risk for bleeding or bruising if used with certain drugs, including warfarin, alteplase, salsalate and urokinase. Taking pineapple with other drugs may interfere with the medicines’ action. These include benazerpril, enalapril, ramipril and trandolapril.